Nearest: Tube Station: King"s Cross St Pancras 211 yards (192 metres), Railway Station: London Kings Cross 0.13 miles (0.2 km), DLR Station: Tower Gateway 2.5 miles (4 km), Motorway: M1 Junction 1 5.4 miles (8.7 km). 5 tube (underground0 stations and 3 major national rail stations all within just half a mile of the hotel (0.8 km). Located in area where you will find a cluster of very similar B&B hotels. However that similarity will be in the fact that they are all housed in converted former Victorian and Georgian residences. Their differences will be in the management and furnishings and for this type of accommodation it's really important to read all the reviews to compare. The Hotel Meridiana is one of the hotels in this area often recommended. The reason for the areas popularity is pretty clear, its amazing transport links and short distance to the most central areas. You have no less than 13 stations within 1 mile and the closest 2 are Kings Cross and St Pancras International. St Pancras is the London terminus for the Eurostar service which runs direct to Paris. The stations also provide connections all over the UK including Luton and Gatwick Airports. Euston station, another of the big 5 London stations is only half a mile away. The hotel sits on the border of central London but all the major tourist districts are within walking distance. Soho is half a mile away and the very centre of London around Piccadilly Circus is just a mile and half. On your doorstep is the British Library, a true national and international archive with in excess of 150 million articles. Other places of interest close by include The Fondling Museum (0.2 miles), London canal Museum (0.3 miles) and Dickens House (0.4 miles). There are several theatres and venues close by including Conway hall, Courtyard Theatre and Workhouse Theatre. The Hotel Meridiana is a traditional style bed and breakfast guest hotel on the edge of Bloomsbury and Kings Cross. family run (since 1958) the hotel caters for tourists seeking budget priced accommodation where the essentials are covered. The building is a former Victorian residence. Cooked breakfast is served everyday (07.00 till 09.00, from 7.45 Sunday) and guests benefit from the free internet access in the public areas and bedrooms. The reception is open from 07.00 till midnight (from 7.45 Sunday). Bedrooms come with central heating (adjustable), tea/coffee facilities and WiFi. Some bedrooms have a shared bathroom, so please make sure you fully read the rate descriptions to see which ones these are. The hotel offers luggage storage and had a no smoking policy. There are no lifts at this hotel. Compared to other London hotels: This hotel has been rated 75% by past guests. The London average is 80% and the average for 2 star hotels is 68%. Therefore while the hotel is below the overall London average you should note that this hotel is above average for its sector (star rating) . Milesfaster ranking: 643rd from 866 London hotels, and 26th of 70 two star rated hotels. Another to Consider: Another hotel that is much like the Hotel Meridiana and not too far away (0.0 miles, 0.1 km) would be the 2 star Wardonia Hotel, where prices begin from around £76 and which has a 74% guest satisfaction rating. We can also suggest a cheaper options nearby which would be the Arriva Hotel. 0.2 miles away (0.3 km), has scored 67% from former guests and has rates from around £43. Can we suggest something with a higher guest score? We suggest the 3 Star Arosfa Hotel Bloomsbury seems like a possible option, it's only 0.6 miles (1.0 km) from here. A highly rated hotel with a guest score of 89%. 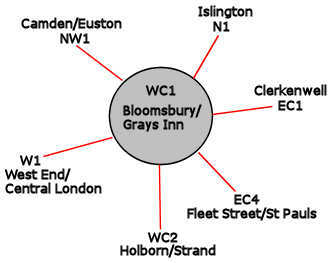 The 50 nearest hotels around this area (43-44 Argyle Square, WC1 postcode) which we have have on our website extend out to a 0.7 miles (1.1 km) radius. The breakdown by star rating is 3 five star hotels (average rating 89%), 17 four star hotels (average rating 82%), 20 three star hotels (average rating 76%), 8 two star hotels (average rating 71%) and 2 one star hotels (average rating 62%). Top 2 star hotels are Crestfield Hotel and the Generator Hotel (both 77%). Of the 50 local hotels top rated is Montague On The Gardens Hotel (4 star) at 99%. Base Rates: We use base rates as a guide to the hotels starting rates. They do not include special offers and deals though so are just a rough guide. Taking all the hotels in the area together the average starting rate is £96 per night. Rates range from £16 at Generator Hotel (2 Star, 77%) with top rates of £222 at Renaissance St Pancras (5 Star, 89%). Rates broken down by star rating: Five Star average: £193, Four Star average: £119, Three Star average: £85, Two Star average: £48 and One Star average: £53. We rank hotels based on their guest rating but balanced for their influencing factors. We rank Hotel Meridiana 34th (joint) of 50 and 3rd for the 8 two star hotels in the area. For lowest base rates in the area this hotel ranks 11th of 50 (5th of 8 two star hotels.). Our ranking for this hotel based on both its rates and its user rating is 15th of 42 for pure value for money (Generator Hotel was top).